The first is made with "Clowns" and the Basic Grey "Color Me Silly". This sentiment is also from River City Rubber Works. Inside the card, its says "be a dire warning". This second card is also made with "Clowns" and the patterned paper is from the Angel Company "Paisley Rockz" collection. The card layout is one I designed, it folds over and slips under a notch. Something a little different. 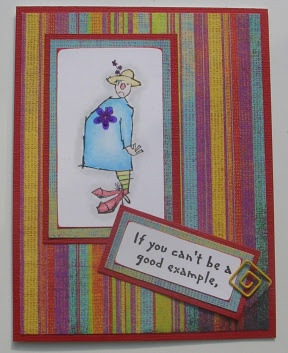 You can find instructions for making this card on A Shade of Blue stamping forum as part of the Blue Heaven E-zine. Great clown cards! That Basic Grey paper coordinates so well!